You can easily start making money from your travel blogs or websites by following the steps given below to join Hello Travel Affiliate Program. Visit us at http://affiliates.hellotravel.com/ , click on the SIGNUP box and then fill up your company information. Once you verify your phone number by giving us a missed call and / or verify your email id , your account gets activated automatically. 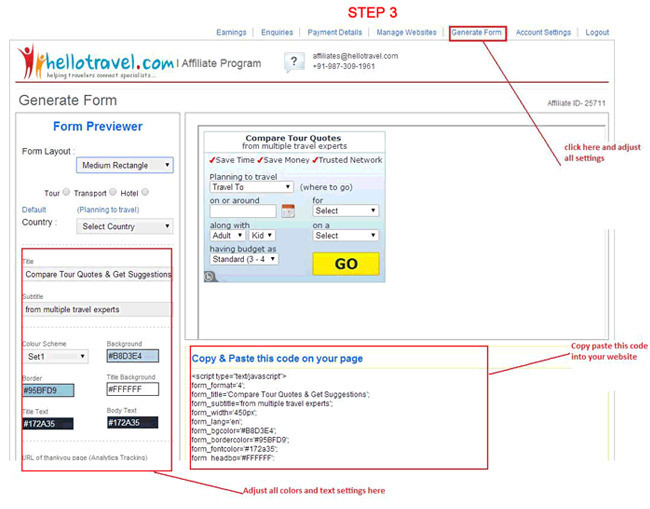 Go to http://affiliates.hellotravel.com/ at the top right and click on the LOGIN section, and login to your account using your email id and password. Choose the form type ( medium rectangle, wide , narrow or full page ) , adjust the text and the color settings and copy paste the code.